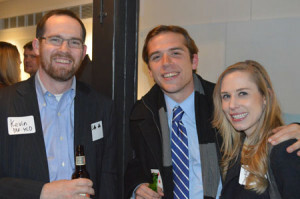 At the Union Station 15 by 15 party on November 13, 2014 (Kevin E. McReynolds, Jeffrey Land and Genevieve Michelle Sabotnik). One of the benefits of attending so many Young Lawyers Division (YLD) events is that I get to meet a lot of the new attorneys who join our legal community each year. I am often asked why it’s worth continuing to be a member of the Denver Bar Association after the free year ends and what young lawyers gain by belonging to the Bar. Belonging to the Bar will help you build a foundation that you probably didn’t have coming out of law school: the certainty of the kind of practice that you want; a job and clients in that practice area; and a professional network that includes lawyers from every other area of practice. The Bar has done all of these things for me and more. When I first moved to Colorado, I got involved with the YLD for a pretty simple reason: I did not know anybody in Colorado. 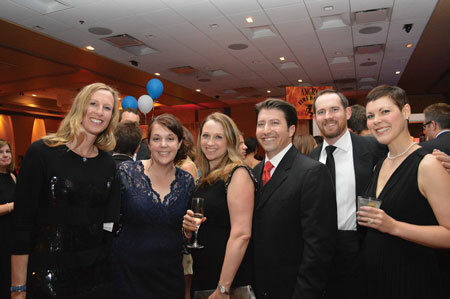 Seeking out other young lawyers seemed only natural, particularly because I was the only associate at the six-attorney firm that I had just joined. Through YLD events, I developed relationships with other attorneys who had very different jobs, practices and types of clients than those that I did. This was invaluable in itself. I gained insight into what other practices were like; I made friends and connections with people whom I could recommend with confidence and who could refer work back to me in kind. Spending time around so many community-minded young attorneys encouraged me to take on a pro bono case through one of the groups that works with the Bar: the Rocky Mountain Immigrant Advocacy Network (RMIAN). This marked an unexpected turning point in my career. What had at first appeared to be a simple case ended up taking nearly two years to resolve. It finally ended when the Tenth Circuit vacated the order to deport my client. Beyond providing me with the obvious satisfaction of helping a pro bono client in this way, this case gave me a crash course in appellate practice — and I loved it. Having pinpointed an area of practice that I was passionate about, I went to CLE programs that focused on appellate work. One of these was a DBA-YLD “Coffee Talk” program on oral arguments, which was taught by two members of the Attorney General’s office who had argued more than 100 appeals between them. I left feeling a bit envious. I later decided to leave private practice and join the Criminal Appeals Section in the Office of the Colorado Attorney General. I now practice exclusively in Colorado’s appellate courts, and the DBA-YLD is the reason that I have a career in appellate law. So, if, like me, you didn’t come out of law school knowing exactly what kind of lawyer you wanted to be, belonging to the Bar can help you. The YLD even has a special program called “Practice Area Preview” that helps young attorneys decide on a career path. We have more senior YLDers with jobs in specific areas explain what their work is like, what they like and dislike about it and how they ended up in their current careers. If you have already found your ideal practice, you can still learn how to develop that practice (and boost your client referrals) by being involved in the Bar Association. As much as you may like the other people in your practice area, it’s the community of lawyers in other areas who are more likely to send you a client. 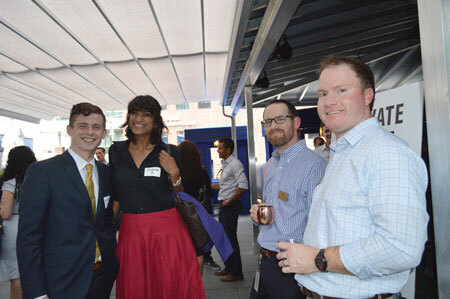 (Top) At the CBA and DBA YLD Happy Hour June 25, 2015: Matthew Kilby, Sutate Ramaiah and DBA-YLD Council Members Kevin E. McReynolds and Chris Levkulich. 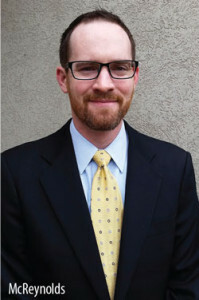 Kevin E. McReynolds is an Assistant Attorney General in Colorado’s criminal appeals section. He also serves as the Denver Bar Association’s Second Vice President and is a member of the DBA Young Lawyers Division Council. He can be reached at Kevin.McReynolds@state.co.us.